The Fuze ECO ME ink is an eco-solvent ink designed for outdoor and indoor applications. It is compatible with all standard substrates available on the market. 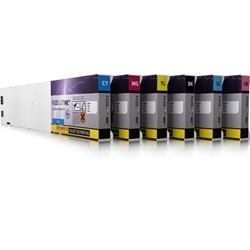 Fuze-ECO ME ink series is formulated for high productivity and is compatible to Mimaki, with Epson DX based print heads. Fuze ECO ME is Mix & Match™ to Mimaki ES3 ink series. Environmentally friendly, fast drying time, superior scratch resistance, perfect jetability, excellent substrate fixation, excellent light fastness and resistance when exposed to outdoor conditions, Mix & Match™ concept ensure chemical compatibility and accurate colors match to OEM ink. This advanced formulation has an extended shelf life and great alcohol resistance.